One of just three year-round native Arctic whale species, bowheads (Balaena mysticetus) are famous for their massive bow-shaped heads, designed perfectly for one of their main challenges: getting through thick sea ice to breathe. Bowheads are able to use their large reinforced skulls and powerful bodies to break through ice 20 cm thick. Inuit hunters in Alaska have reported whales surfacing through 60 cm of ice. Their heads make up about a third of the total length (which in adults can be up to 20 metres – newborn calves are about 4 metres long and weigh 2-3 tonnes). They are also known in quiet Arctic waters for their intense bouts of social group interactions, involving tail and flipper slapping, and breaching (leaping entirely out of the water) – an impressive feat for whales that weigh up to 100 tonnes! When migrating they swim, not surprisingly, rather slowly, at 3-5 kilometres per hour. Bowhead whale (Balaena Mysticetus) just under ice, Arctic. 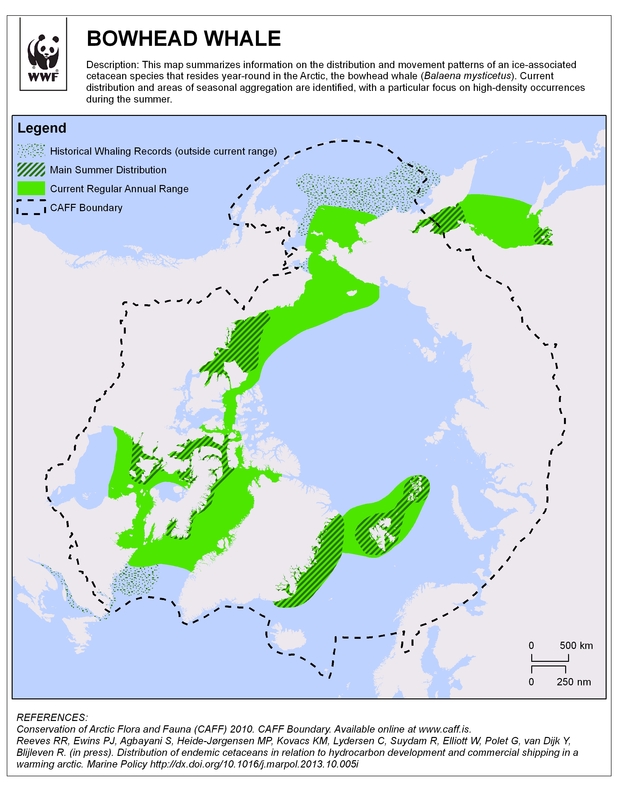 Still recovering from severe over-hunting that started as early as the 16th century and ended only when populations crashed to near extinction, there are estimated to be about 20,000 bowhead whales currently, spread across 3 distinct geographic regions, with 90% of these summering in Canadian waters. In 2009, Canada created the world’s first bowhead whale sanctuary in Nunavut, the Ninginganiq National Wildlife Area. 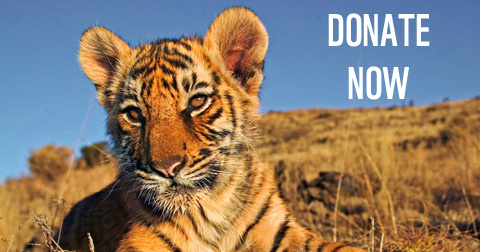 Learn more about how WWF helped build the scientific case for creating this designation. Why is the bowhead important? 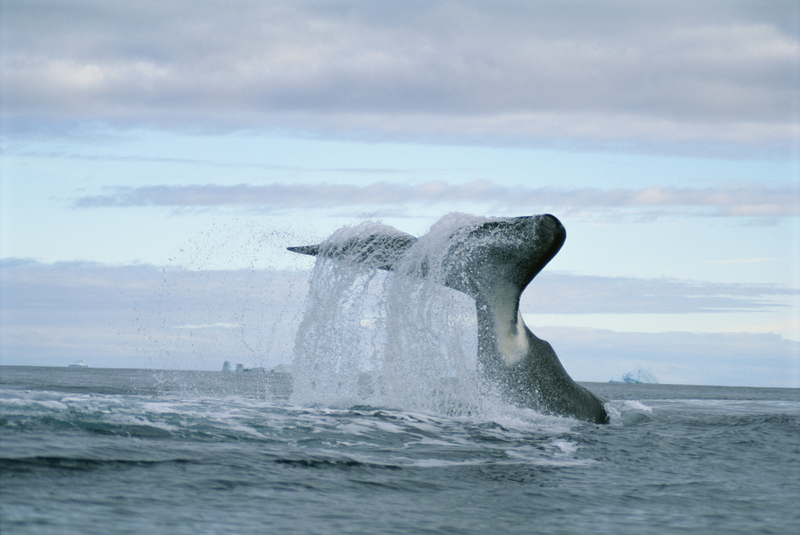 Whales are close to the top of the food chain and important indicators of the overall health of the marine environment. 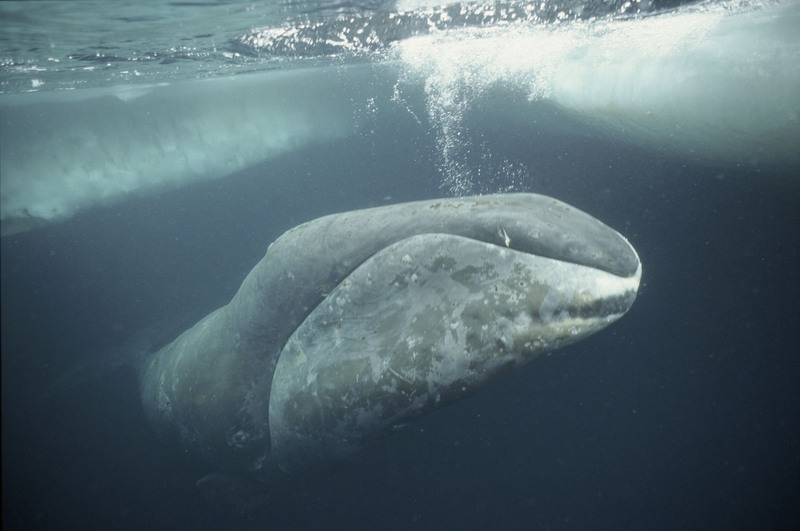 The bowhead whale’s conservation status is listed as “least concern” overall, but some populations (such as the East Greenland-Svalbard population) are “endangered”. They have traditionally been hunted by commercial whalers until the last century for oil, meat, and baleen. Today, a few native communities in Canada, Alaska, and Greenland hunt bowheads for subsistence purposes. This subsistence whaling is approved and its sustainability is ensured under the regulatory watch of regional co-management bodies and the International Whaling Commission. The chin of a bowhead whale (Balaena mysticetus) surfaces at Isabella Bay (also known as Ninginganiq), Nunavut, Canada. Like the other ice whales (narwhal and beluga), bowheads have no dorsal fin, enabling them to move easily under the sea ice. They typically spend the entire year in Arctic waters, their travels shaped by the melting and freezing of the ice, and seasonal movements to a series of predictable spring-summer productive feeding areas. They have a very thick layer of blubber (up to 40-50 cm), which serves primarily as an energy store to see them through the annual cycle. Bowheads can dive for over 30 minutes at a time. Bowhead whale (Balaena mysticetus), Isabella Bay, Nunavut, Canada. Bowheads are baleen whales, with about 250-350 keritanous baleen plates on each side of the upper jaw. They use these massive vertical plates – up to 4.6m long in fully-grown individuals, the largest of any whale – to filter their food from the huge open-mouth gulps of water that they take. They need to eat about 100 tonnes of food annually, mainly tiny crustacean zooplankton. Most of their annual feeding occurs in the summer months, and much of that in Canadian waters. Bowhead whale (Balaena mysticetus) flukes in Isabella Bay, Nunavut, Canada. The bowhead whale has been a victim of the appeal of its long baleen plates and thick blubber, which have made it, and its closest relative the right whale (Eubalaena glacialis and japonica), the most economically valuable whales. Hunted by commercial whalers until the last century for whale oil and baleen, bowhead whales are today still recovering slowly from their economic extinction. Some populations are faring better as a result, but it will take many more decades for this long-lived and slow reproducing species to recover to its pre-whaling numbers. Inuit in Canada, Greenland and Alaska are allowed a limited subsistence hunt for bowhead whales, sustaining important cultural traditions and values. 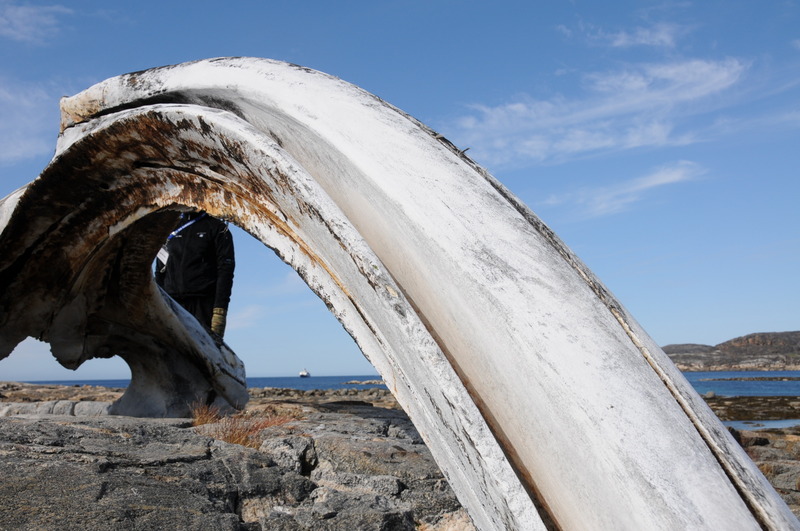 A bowhead whale (Balaena mysticetus) bone on Kekerten Island, Nunavut, Canada. Modern threats include sea ice retreat and changes to food web dynamics due to rapid climate changeand ocean acidification. Bowheads are also affected by direct and indirect impacts of increased development such as oil and gas exploration, commercial shipping, and fishing. What would an oil spill in Canada's Beaufort Sea look like for bowheads and their ecosystem? 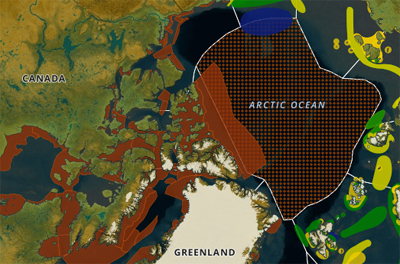 Explore WWF's oil spill trajectory modeling project at arcticspills.wwf.ca to find out. The Canadian and Alaskan governments have attached satellite radio transmitters to a sample of bowhead whales, in order to better understand seasonal movements and habitat use of these Arctic giants. 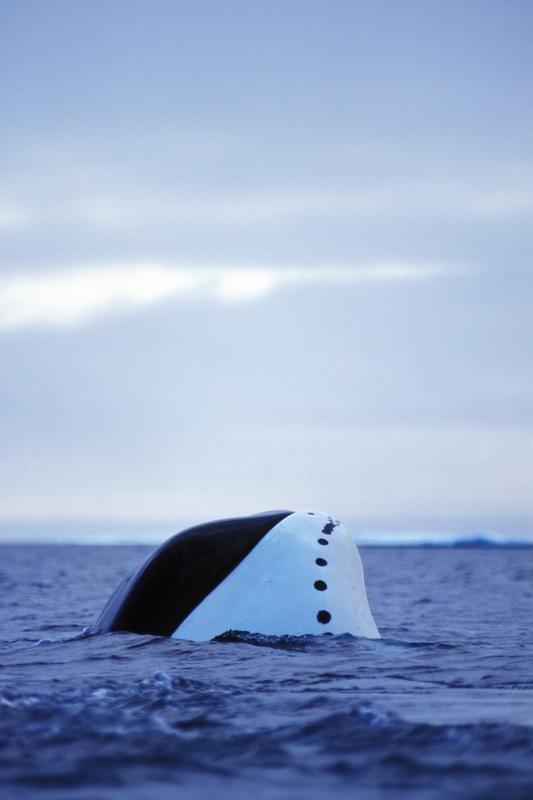 This information can be used to identify and protect the most important areas used by these whales, and to help plan for further human activities (like shipping and development) in these sensitive, quiet arctic waters – the bowheads’ home – and in all decisions regarding the future of Arctic marine systems facing rapid climate and economic change. Status: IUCN: Least concern; Lower Risk/conservation dependent (Bering-Chukchi-Beaufort Sea subpopulation); Endangered (Okhotsk Sea subpopulation); Critically Endangered (Svalbard-Barents Sea (Spitsbergen) subpopulation). See the IUCN details. Bowheads have suffered from intense over-hunting by commercial whalers until the last century for whale oil and baleen. Some populations are faring better as a result of the International Whaling Commission’s commercial whaling moratorium. Like other large whales, bowhead whales are also threatened by other human activities, including habitat changes, related to rapid climate change, as well as offshore oil and gas exploration and increased shipping in Arctic waters. 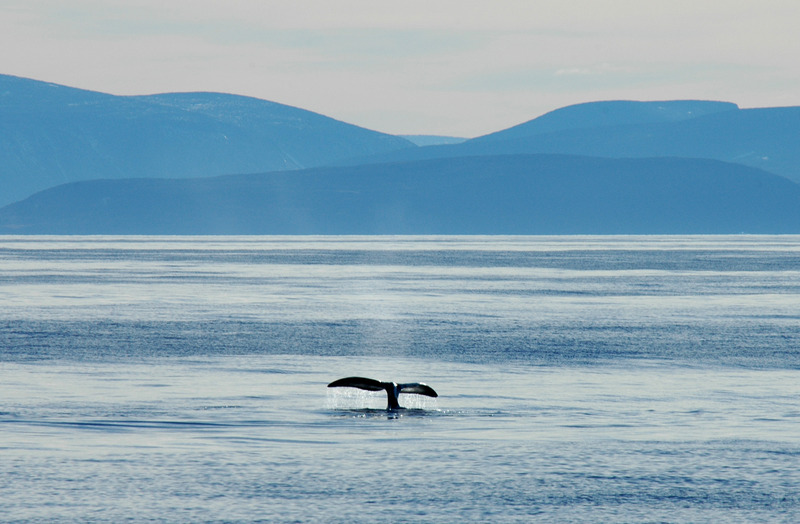 WWF is working to identify and secure protection for critical bowhead whale habitat, as well as addressing the risks of increasing Arctic development and rapid climate change. 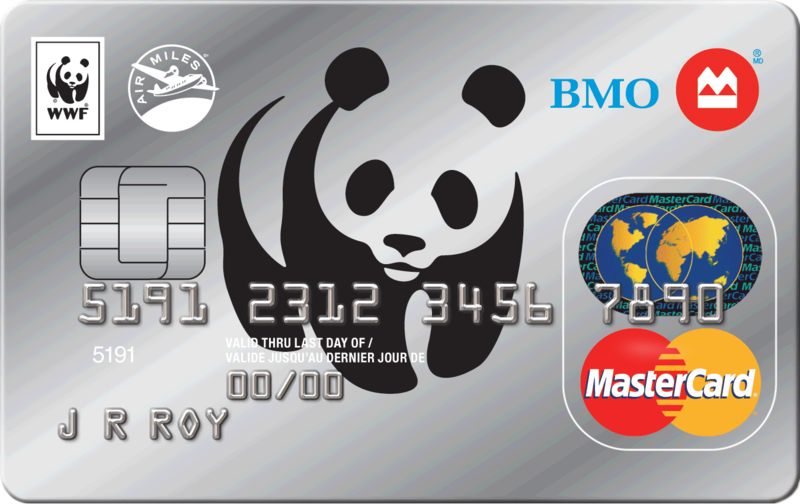 WWF also played a key role in establishing the world’s first bowhead whale sanctuary. Learn more about WWF’s work in the Arctic. See how shipping routes overlap with the native range for different marine mammals. Like many whales, bowheads are highly vocal. The increase in shipping traffic and development in the Arctic puts their communications at risk. Bowhead whale at Isabella Bay, also known as Niginganiq, Nunavut, Canada. 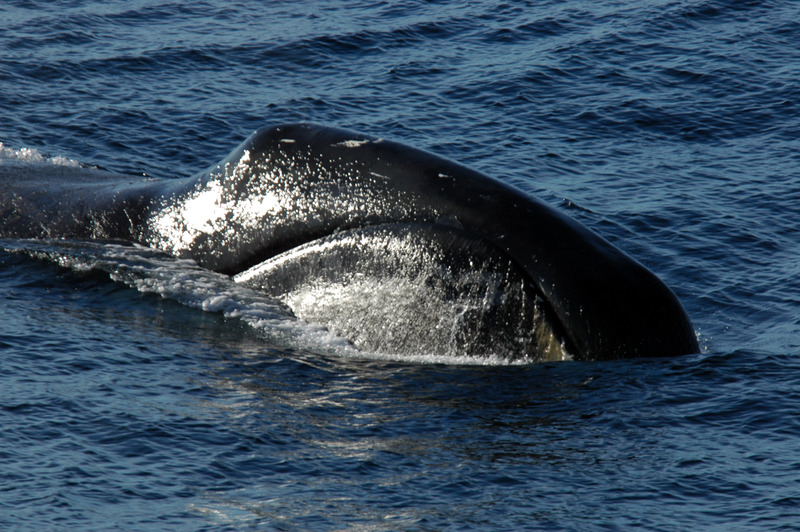 Bowhead whales can live for over 150-200 years, making them the longest-lived wild mammals on the planet.